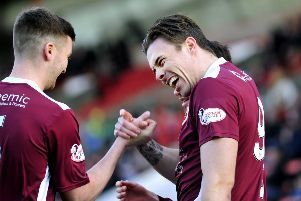 Stenhousemuir face a familiar scenario on Saturday as they take on a Clyde side with a point to prove after a managerial departure. It’s not the first time the Warriors have been in that situation in recent weeks - but boss Brown Ferguson is more concerned on making sure his own players build on their superb showing at Stirling. He said: “We’re one game into the second quarter and I think there’s only five managers out of the 10 remaining from the start of the season. “It’s absolutely ludicrous the turnover of managers there appears to be in the game. Stenny’s 2-1 success put the brakes on a Stirling side threatening to motor away from the rest of the league - Clyde are the only other team to have beaten them - and tightened up the top half of the table considerably. Ferguson said: “We’ve performed to that level on a couple of occasions this season but it was an excellent performance. “The result was great but the general display of the group of players was where we wanted to be and on the back of a disappointing result and performance at Elgin, to go and dominate the game against the league leaders was very pleasing. “There’s no denying the game on Saturday was one we couldn’t have afforded to lose. To create that gap at this stage is something that you don’t want but we managed to close the gap to four points. “When you just look at the league table, four or five points separating the top four or five teams is nothing at this stage of the season.